I don’t know about you, but in order to be fully connected with my work and fully invested emotionally in it, I have to be clear on what I’m actually doing. What is the point of it all, why is it important? 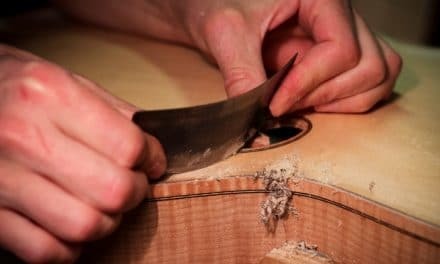 When I sort through all the different layers and levels to get down to the core of what I do as a guitar maker, what I find when the dust settles is a generous act of giving, connecting, and communicating with people. 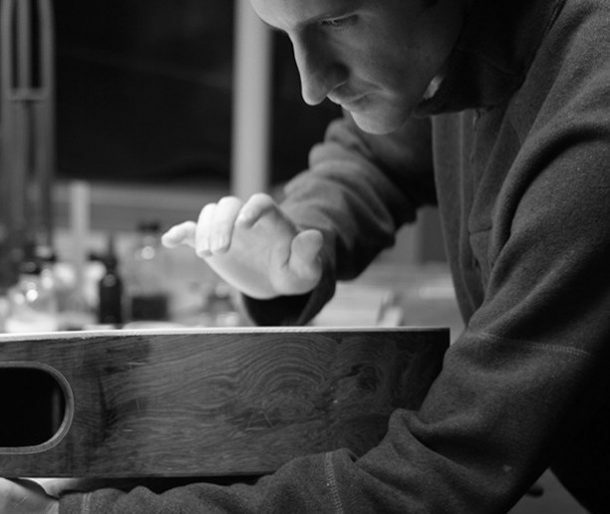 For me, my medium is hand made guitars, but for you it could be something different. Whatever the medium may be, keeping this fact, this primary motivation in mind is of utmost importance and can transform our work from being just another product into a unique and meaningful work of art. 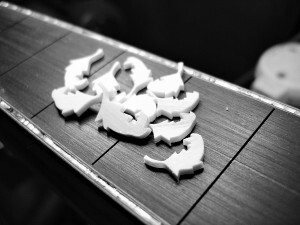 Despite my greatest efforts to force myself to get in line with the manufacturing model and get efficient and produce more guitars, to streamline, and standardize — I have never been able to do it. It just isn’t in me. For years, I beat myself up for this and at times I felt like a failure. I wasn’t unhappy or unfulfilled, but I felt that way because my business wasn’t as profitable or big as others and I could not buy the ads and the endorsements that others could. I longed to be able to attend all the guitar shows and do what everyone one else did because after all, from the outside it looked like they were doing so well and from the inside it looked like I wasn’t, but things are not always as they seem. Eventually, I had the startling realization that what I had previously thought to be my biggest fault was my greatest strength. That strength is in the fact that I am not a guitar maker, (well not just a guitar maker anyway) or just a businessman, I am an Artist. Someone who strives to create something beautiful and meaningful, something that makes a difference and a significant contribution to other peoples lives and even to our society or culture. Making art and being an artist is about connection, and relationships, and communication. It is about friendships, and generosity. 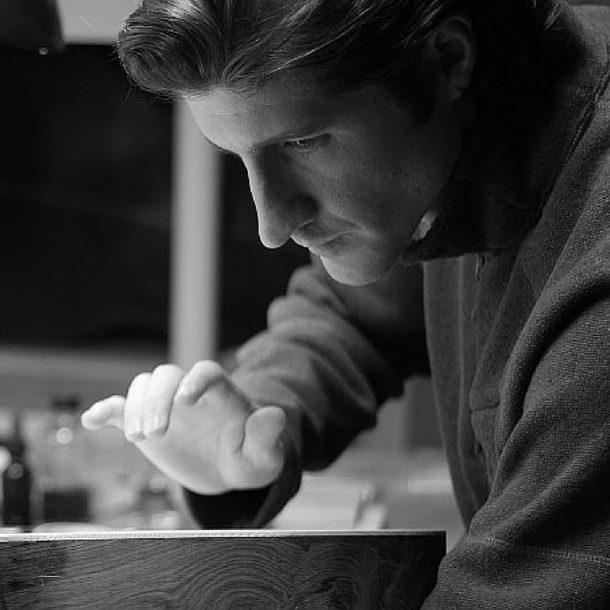 It is about pouring my best effort, my heart, my soul, and life into my work. Not for a profit, but because I care about the person for whom I’m doing the work. The money is not important, the guitar is only a means, the person and the relationship are of utmost importance. 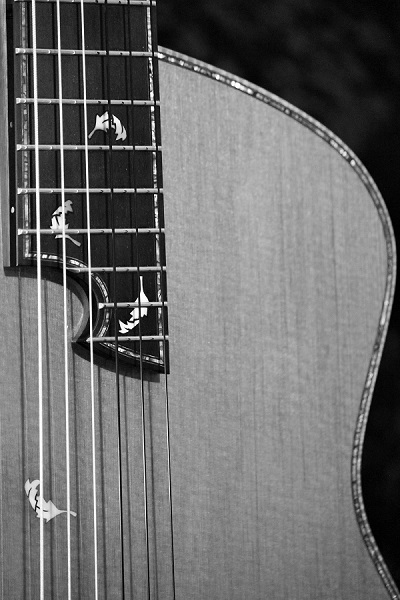 The impact the guitar has on the lives of the people who encounter it and hear it is significant. I want that impact to be the best it can possibly be. I want it to influence people in a positive way and lift them up, inspire them to go higher, push further, work harder, take more risks, and create their best music with it. That is the true purpose of my art and why I believe creating art is more important than making money. Don’t get me wrong, there is nothing wrong with making money, and if everything is in line, great art should also bring with it profit, but the point is that the profit isn’t the goal, the art itself and its message, it mission is the goal. If the money becomes the goal, then the actions taken cease to be true art. 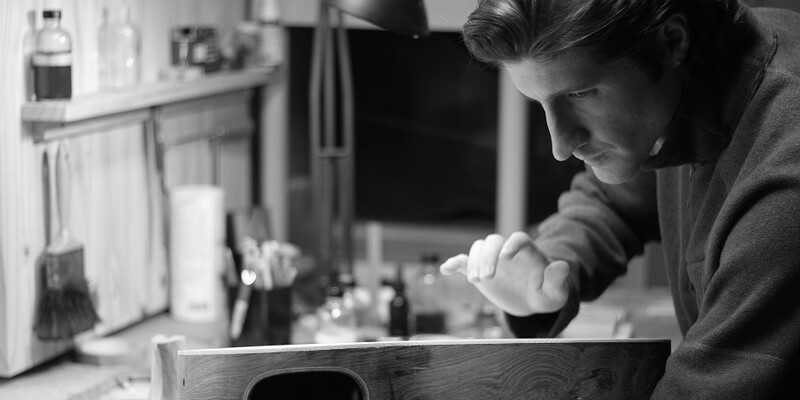 Without my art, my life wouldn’t be as rich or as fulfilling, but it isn’t just about me. A good test might be to look at what the result would be if others didn’t have my art, would it affect their life? If so, in what way? My hope is that my guitars, my art form, have touched the hearts and lives of others, many others, in a very deep and enriching way. Directly through the guitar, and indirectly through the relationship I have been privileged to grow with each client. The experience of working together with people IS the point of it all, two people with a unified vision, working together to bring it into reality. Supporting and encouraging one another. 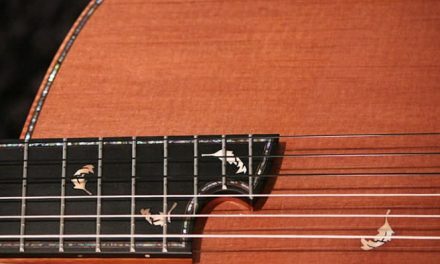 There were times when my clients were facing hardship, struggles of family, finances, and health, and I was happy to do all I could to stand by them, encourage them, and pour my emotions and care into their guitar as I created it. My hope is that my care and the attitude of my heart as I worked, stayed with that guitar and even to this day it continues to convey itself through the instrument as they play. There were also times when I was struggling with things myself, family, physical, or financial, and I was and am still truly blessed to have my clients, my friends, there to stand by me and encourage and support me. Together we endure, and together we help one another to reach higher and go further. Sometimes we can even help one another to break out of the comfort zone and go to the next level, to take that big risk and go for it. So never again will I feel bad if I’m not efficient enough or streamlined enough, or if I can’t make a guitar cheap enough. My goal is to continue to create high art, art that matters, art that makes a difference because of the story it tells, the lives it touches, and most importantly the connections and relationships it forges. So to all of you who have embarked on this journey with me in the past I thank you from the bottom of my heart, you are my friends and co-conspirators in our mission to improve the guitar, and improve one another’s lives. And to everyone who will join me in the future I am eagerly awaiting your friendship, collaboration, and our journey to work together to create art that matters and that makes a difference in our lives and in the lives of anyone who gets to experience it. 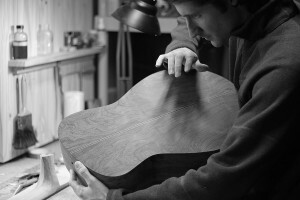 I’m not a guitar maker, I just make guitars. You and I are not our jobs. We are artists, who CAN make a difference in our world with the unique talents and gifts we have been entrusted with for the short time we are here on planet earth. Regardless of your job and in whatever you do, do art, take the risk, invest yourself fully into the work, make the connections, be vulnerable and see what it’s like to really feel fulfilled when you are operating outside of your comfort zone and in the zone that you were made for. Today is the day, get out there and make your art — The world is waiting! 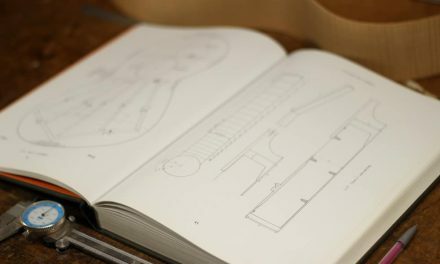 Making Master Guitars: An Awesome Book Every Luthier Needs! Great post Tom. Defining who you are by a job title does really sell yourself short. I also agree with your thoughts on modeling ultra-efficient production-style building. The extreme case is a Gibson factory tour video I just watched recently that left me a little depressed. They go through so much wood and the workers look totally burned out. High volume / low cost to be financially successful is a really uninspired goal. The trick for the one-man shop is to balance doing exceptional work with staying in business. 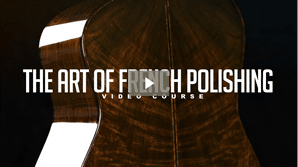 Love the French polishing course by the way, well done. Good read. It’s hard for me to put feelings into words, this article is very close to how I too feel about building works of art. Really needed that, thanks man. Thanks Daniel, so glad it was helpful! We all have motivations in life, recently mine has totally shifted. The definition of success is different to every person, I do not want to be just successful, I am now looking towards significance, I want to impact peoples life’s to reach there true fulfillment .Tom, getting to know you little by little, I am realizing that you are at that point in your life, “Your commitment to excellence is in direct proportion to your quality of life” (Einstein) . Thanks Alfonso, appreciate that a lot. I don’t have it all figured out, but I do know that someday when I look back on my life, its the people like you that I had the privileged to know and hopefully impact in a positive way and be a blessing to that will make what I leave behind meaningful.